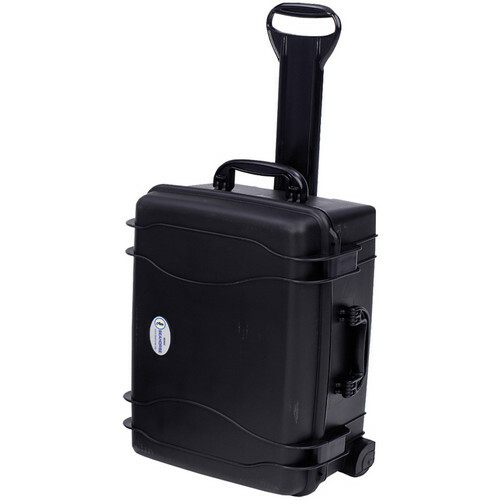 Store, protect and transport your valuable gear with the black SE-920 Hurricane SE Series Case without Foam from Seahorse . This well-made case is waterproof, dustproof, and made of ultra high-impact copolymer. ABS double throw latches provide quick and secure closure. The case has an automatic purge valve for equalizing pressure, and large handles on the top and side allow for comfortable carrying. For added security, the case features two holes for user-supplied padlocks, and conforms to Mil-Spec and IP standards 67. When traveling over level ground, the case may be rolled with the retractable extension handle and built-in wheels. Box Dimensions (LxWxH) 25.0 x 16.7 x 7.4"
SE-920 Hurricane SE Series Case without Foam (Black) is rated 4.8 out of 5 by 6. Rated 4 out of 5 by DCI from Nice latch mechanism... Use this case to carry my Audio Kit, I am confident that it will offer a great protection for my SD mixer and wireless microphones. Especially like the latch with a locking mechanism, latch is easy to open, but when it locket won't open accidentally. Except for the retractable handle that look a bit flimsy very happy with the competitively priced case. Rated 5 out of 5 by roninseattle from perfect size, nice quality I was a bit worried as I saw one review showing a warped seal but my case has a perfect fit and the quality is great. I like the double handles and the retractable handle is well design. It also fits my Lowel uni stands perfectly. Rated 5 out of 5 by Curtis from I recommend this case to all my peeps! This case is great! I use it to carry my tools as a checked luggage without it getting torn up. Rated 5 out of 5 by addiel from Good Price and Super Quality I bought it for protect my 17" Broadcast Monitor and is perfect I'm Love it. Rated 5 out of 5 by Herring223 from Great Case Well built case perfect for what I need. I use the SE-920 to carry my AV gear for seminars. Is there a piggyback unit that I can attach to carry my paperwork and books? Unfortunately there is no extra add for this case. My apologies. But if you were to get a case from maybe a luggage store with a strap that can go through the rolling handle that might work actually. I've been using the SE-920 for all of my AV equipment. Is there a piggyback unit that I can get to carry additional materials? the 1500 series has a handle yo can latch on to the pull up handle of the se-920 to piggyback. Its all hardcase so don't look for a lay-flat fit but you can certainly piggyback them together.